Today, we are excited to launch the public preview of the Power platform admin center; built to become the go-to destination for administrators creating, managing, and supporting their environments. To accomplish day-to-day tasks, administrators currently navigate to multiple admin centers. As we unify the platform for business applications, we are bringing administrators a unified admin center. The Power platform admin center will continue to add functionality until this becomes the only admin center to accomplish all tasks related to Power platform. Go here to get real-time, self-help recommendations and get support for Dynamics 365, PowerApps, and Microsoft Flow. Open new support requests and check progress on existing ones, select the exact instance or environment that requires support. Select the exact instance or environment that requires support. Get self-help guidance without having to go through support by clicking on See solutions. 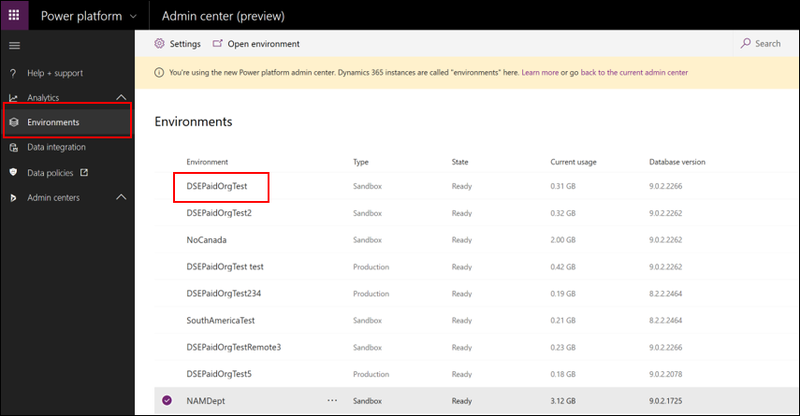 For example, if you are experience issues with your storage consumption, the suggested action takes you directly to the Analytics section of Power platform admin center to view storage breakdown per environment. For more information on Help + Support, see Get Help + Support. 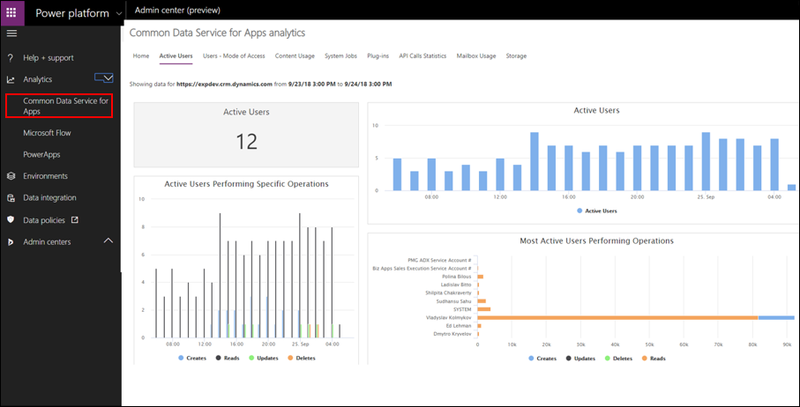 As part of the recent preview release of the Power platform admin center, we are happy to announce that analytics for the power apps admin is now available in public preview. This includes reports for Common Data Service for Apps, Microsoft Flow, and PowerApps. We’ve improved how you view metrics for your CDS for Apps. You no longer need to install or update a solution. Instead, you can view analytics right from the Power platform admin center, Analytics > Common Data Service for Apps, to quickly view adoption, usage, API statistics, top plugin and workflow failures, and more. For more information, see Common Data Service for Apps analytics. 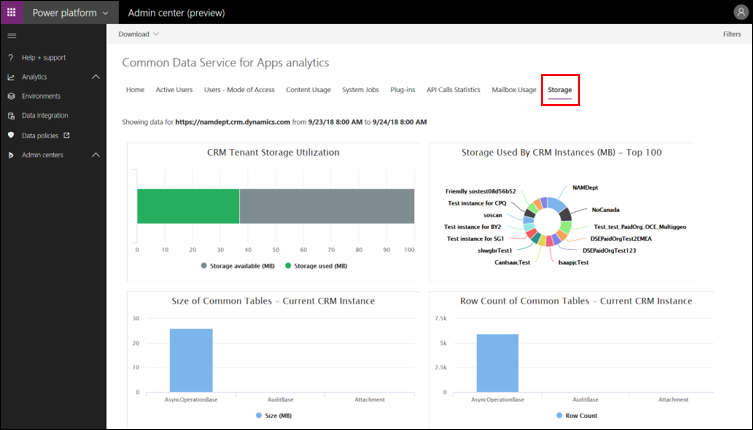 Access to analytics – all tenant admins can access the analytics for Common Data Service for Apps, Microsoft Flow, and PowerApps. Additionally, the system admins of 9.0 CDS for Apps environments can also access the analytics for their environments. This initial release allows tenant admins to view these reports on a per environment basis for a maximum period of 28 days. 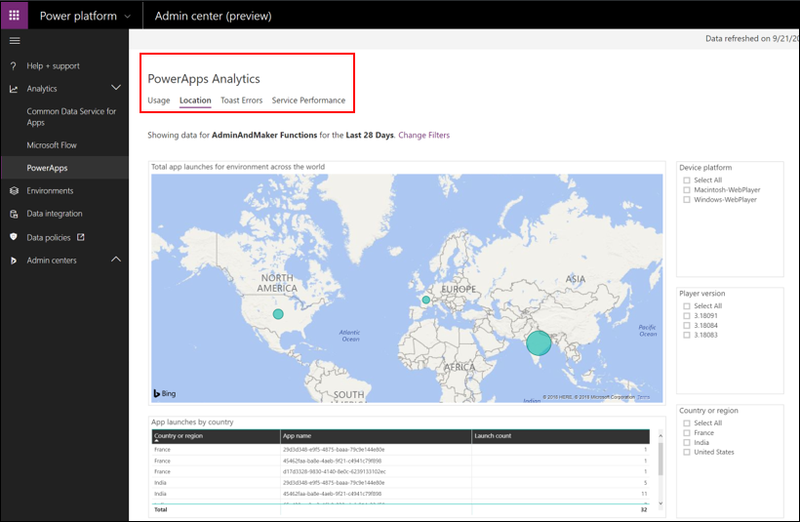 In addition, Microsoft Flow and PowerApps analytics are now also available in the Power platform admin center, under the same Analytics section. 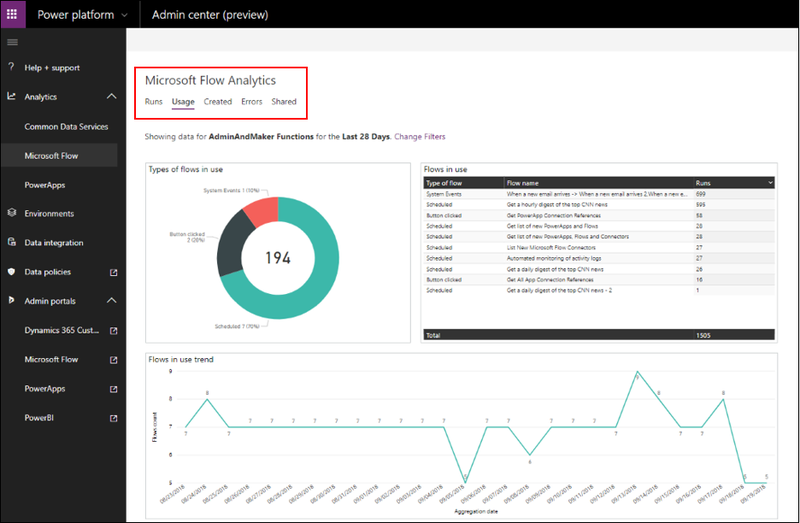 Learn more about Flow and PowerApps analytics in a blog to be posted soon. Check back here for the link. It will provide details on all that is shipping with this preview such as usage (screenshot below), runs, and other insights. 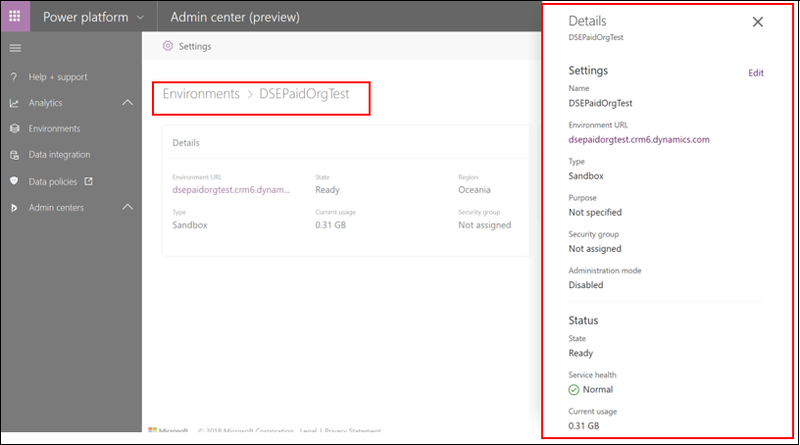 Now you can have a single list of all your environments (known as instances in Dynamics 365 admin center) that is more performant, allows you to sort on all properties, search across environments, and open environments. Clicking on a specific environment takes you to the environment hub where you can see more details such as admin mode settings, security group assignment, and service health. You no longer need to manage all settings by opening each environment, you can do it all in the Power platform admin center, just click Settings. For example, you can now easily manage your email configuration settings using our Email settings and Email tracking pages. Within the Email settings page, you can quickly manage how you want your users to sync their correspondence with important clients and leads using the synchronization methods settings. Initially a few settings and operations will be available. As we roll out updates to the preview, additional settings will become available. Access other Power admin centers: we want Power platform admin center to be the destination you go to. 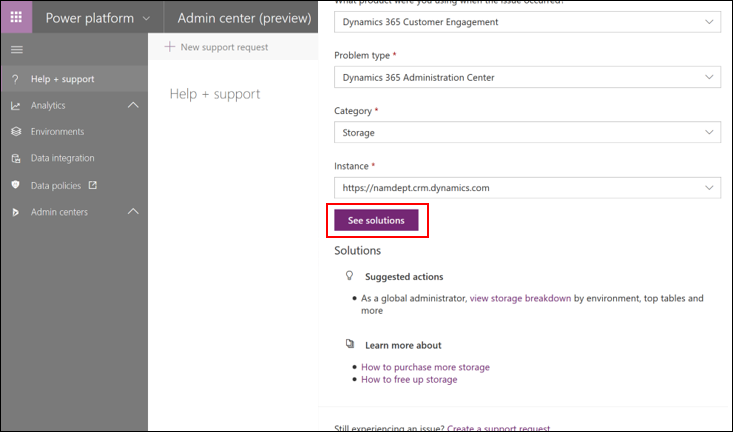 In the meantime, you can access Dynamics 365 admin center, Microsoft Flow, PowerApps, and PowerBI under Admin centers. We hope you find these new capabilities helpful! To stay informed on updates and functionality, see Administer Power platform.